I’m a pen and pencil person. There’s something lasting about the tactile experience when using a writing instrument. Writing with a pen or pencil feels real and I obsessively purchase all sorts of pens and pencils so I jumped at the chance to review Stilform’s Kosmos pen. Stilform is a design outfit out of Munich and the Kosmos is their first pen. Special editions of the pen launched on Kickstarter a few weeks ago but they sent me one early. Spoiler: I like it. 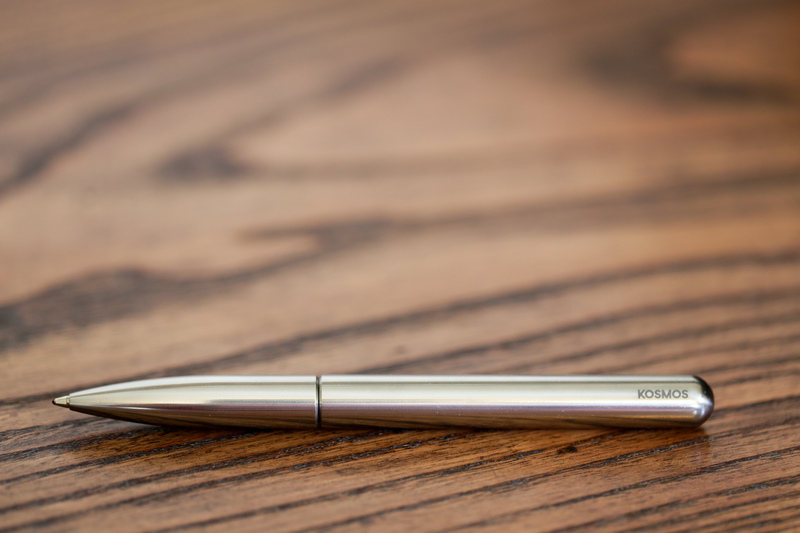 The Kosmos pen offers a compelling writing experience unavailable elsewhere. Stay with me. There’s something special here. The pen is two pieces of solid metal. This one is polished titanium from the new Titan line. It’s heavy and smooth in a pleasant fashion and the weight turns the pen into a sort of posh fidget spinner. It just feels nice in the hand. Push the two pieces together and the pen reveals the tip. There’s a solid click. You know it’s open. This isn’t a ten-cent retractable pen. It’s the mechanical shutter click of an old rangefinder compared to the sound of a disposable camera. Likewise squeeze the two parts together and the pen retracts. The operation can be performed one-handed though the smooth surface means it takes a bit of effort. But you know it’s done. Inside is a Parker-type G2 refill. The one that came with this pen offers a smooth operation though the ink is a little light for my taste. I like bold lines and this one writes in a sort of muted fashion — fine for some, but I prefer darker ink. Thankfully there are countless Parker G2 refills; any will work in the Kosmos. I spend a silly amount on pens and pencils. Jetpens.com steals a chunk of my paycheck. Most of the time I opt for Japanese gel imports or drawing pens over exotic fountain or ballpoint pens. After all, in the end, these things are just pens and my kids steal them. There’s something about this pen though. I’m hiding the Kosmos from my kids. The Kosmos is intoxicating and I can’t stop using the pen. It’s the click and feel of the stainless steel body. It feels like a bespoke Fisher Space Pen, and to me, the Fisher Space Pen is the pinnacle of pen function over design and must be respected. It’s important to celebrate novel advances in design from small outfits like Stilform. Throughout this age of consumerism true design innovation rarely comes from the dominant player and more often comes from the startups that must take a chance to get noticed. And believe me, the Kosmos will get noticed. The special editions of the pen are currently available on Kickstarter and Stilform’s website. Pricing varies between color and package options though you can expect to pay around €50 per pen.